Product #1873 | SKU NI2414GAFS | 0.0 (no ratings yet) Thanks for your rating! This fast, f/1.4 lens is effective in low light settings and captures a natural wide angle of view on both FX and DX format cameras. 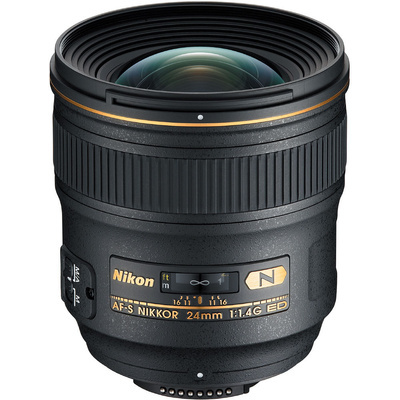 The two ED elements in the AF-S Nikkor 24mm f/1.4G offer superior sharpness and colour correction by effectively minimising chromatic aberration, even at the widest aperture settings. The Nikon Silent Wave Motor (SWM) enables fast, accurate and quiet autofocus. Rear focus provides smooth and fast autofocus while eliminating front barrel rotation and lens extension. Nano Crystal coating reduces ghosting and internal flare across a wide range of wavelengths for impressive image clarity. The M/A focus mode switch enables quick changes between manual and autofocus operation. Precise manual focus is available at all times, even in AF mode.